After a long and tiring day at work, all of us yearn to get back home and sink in the comfort of our cozy bed. Don’t we? So, needless to say, the bedroom is perhaps the most favourite area in the entire house. And naturally, a lot of effort and thinking goes into designing it in the best possible way. If you have something different in mind, then choose red for your bedroom. Red is not only the colour of passion but is also one of the classiest shades that can be used in bedrooms. And there are plenty of ways in which you can spruce up your red bedroom to make it eye-catching. Let us check out some ideas below. 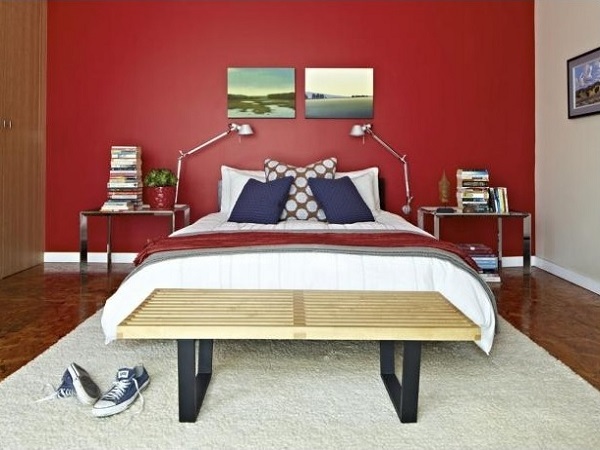 If you wish to design and deck up your red bedroom in a trendy fashion, then try colour blocking on the opposite wall. You can play with similar or complementary colours that will strike a chord with red. Using a light shade on the adjoining or opposite wall will put in an edgy dimension to the overall look of your bedroom. For a bedroom with red walls, it is important to select the right shades of colours to make the colours pop out and make the room lit up. Red rooms often tend to appear more compact than they really are, so using light hues like white, blue or lemon on bed sheets and covers will strike a lovely balance. However, try to stick to a single bright shade to keep the décor classy and not clumsy. When it comes to furniture, choose wooden or dark tones for a sophisticated look. Black furniture will definitely add to the contrast and create a different dimension for your bedroom. But if you prefer using wooden tones, then choose darker woody shades on your furniture for a timeless look – this combination is sure to stand the test of time. Choose decorative items in black or white to adorn the red walls of your bedroom. It is always better to go minimalistic when it comes to embellishing the walls – keeping the decor free of clutter will make them look outstanding against the red backdrop. To add an element of sensuality or some drama to your bedroom, go for accents. Subtle textures like a fine golden sheen on red walls or a muted metallic accent on the wall will look every bit eye-catching. You can enhance this sheen by using yellow focus lights that highlight the textured walls beautifully. Elements such as light effects can be best used to direct the focus on certain areas of the bedroom to add to the dramatic look. There are countless ideas in which you can decorate your red bedroom. A red bedroom appears not only classy but also looks equally sensual and comfortable. But to keep it perfect and attractive, we must be cautious enough to not overdo the decor.